A quadriga is a chariot drawn by four horses (a two-horse team was called a biga, a three-horse team a triga) its main use was in races or as a triumphal chariot driven by victorious generals and emperors during triumphal processions. 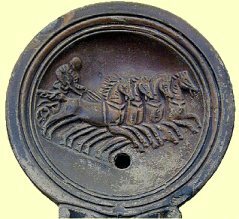 In battle the chariots that were used had two horses because a four horse chariot was way to hard to control. The racing quadriga was immensely popular in ancient Rome. The charioteer drove standing upright in his chariot and he belonged to one of four teams or stables (factiones)(the red (russata), the green (prasina), the white (albata) or the blue (veneta). Everyone supported one of the four teams and this went so far that fights between supporters were not uncommon. Its known that the emperor Caligula was a huge green supporter who spend a lot of time with the riders and in the stables of his beloved team. With such an intense popularity its not strange that the best drivers were considered to be real superstars not unlike modern day sports stars. Gaius Appuleius Diocles was perhaps the greatest star of them all. He was a quadriga charioteer who is said to have contested in 4257 races. Of those he finished second 1437 times and won 1462, his winnings totaled nearly 36 million sesterces. During Caligula's reign the great name was Eutyches, he was the emperors favorite and he received no less than two million sesterces in rewards and prizes. The most famous racing arena was the Circus Maximus which could seat no less then 250000 people, it dates back to the sixth century BC and was approximately 1,970-feet long and 660-feet wide. The two horses in the middle of a quadriga where tight to the yoke and the two outer horses where connected to the middle horses with sturdy ropes. All races were run counterclockwise. The horse closest to the spina, or median wall of the course, had to be the strongest and the best trained. This was especially true in quadriga races where the outside-right had to drop back a half stride and pull the others around the corner. The outside-left horse on a quadriga stepped forward, turned in, and pushed around the turns. It had to have the most stamina since it actually ran farther, and faster around the turns. This outside horse was considered to be the most valuable. The race lasted seven laps around the stadium, for a length of roughly 4000 meters when measured in the Circus Maximus. There were incredible tight turns at either end of the track, around the narrow isle (spina) which divided the arena. Each end of the spina would be formed by an obelisk, which was called the meta. The charioteers would try to corner the meta as tightly as possible and this could lead to crashes which were quite frequent and spectacular and of course part of the entertainment, not unlike modern day autoraces. Rules were virtually none existent and the first to complete the seven rounds was the winner. A lot of drivers died at a young age, they had almost no protection and wore only a light helmet. They tended to wrap the rains tightly around themselves so that they could control the horses with their bodyweight but in case of an accident they would be dragged along by the horses and ran the risk of being trampled to death. 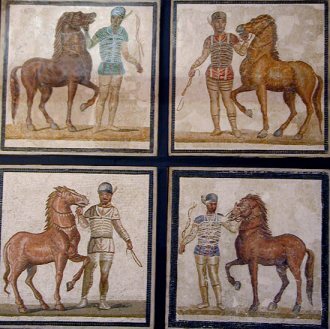 The races however were by no means as deadly as other forms of Roman entertainment, drivers and horses could win and survive hundreds of races. For a (perhaps not entirely historically correct) spectacular quadriga race see the racing scene in the movie Ben Hur. "To win glory, stepping into the chariot of honored Nike: for to one man only does the goddess grant to jump into her great carriage." Nike was the Greek equivalent of the Roman Victory. After Augustus this honor of a triumphal parade was strictly reserved for the emperor. He was preceded by his captives and spoils taken in war and was followed by his troops. His captive was preferably the enemy king or chieftain who would be unceremoniously killed after the parade. The procession went up to the Capitoline hill where sacrifices would be made at the temple of Jupiter. Jupiter was considered to be the conqueror of all things and was the god in whose honor a triumph was held. The triumphal quadriga was a splendid piece of work sculpted and painted with wonderful decorations finished with gold and ivory. The extremities of the axle, the pole, and the yoke, were highly wrought in the form of animals' heads. The chariot was elevated so that he who triumphed might be the most conspicuous person in the procession, and for the same reason he was obliged to stand erect. A slave stood behind the triumphator and held a golden laurel crown over his head (not touching it). This slave had to repeat continuously "Memento homo." (Remember you are mortal) warning that all glory is fleeting. On coins the quadriga was used as a symbol of victory and its often driven by Victory herself. The quadriga was a feature commonly found on the Greek coins of Syracuse. The early silver coinage of the Republic resembled those coins and included a didrachm and drachm denomination. The didrachm was known as the quadrigatus due to the commonly used quadriga reverse design. The quadriga's on coins are not only pulled by horses or elephants but also by goats and even snakes. 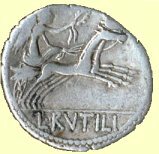 On later Roman coins the quadriga is often driven by a deity or the emperor himself with sometimes Victory flying overhead holding a laurel wreath over his or her head. The quadriga is also used on posthumous coins taking the emperor to the heavens and is also depicted as the chariot of Sol Invictvs.